When Jennifer of Jaybird Designs e-mailed asking to include my adjustable ring tutorial as her favorite tip/trick in a newsletter she was guest authoring, I was flattered and my answer was, “Absolutely!” The adjustable ring is a method of beginning crochet in the round so that the starting tail can be used to pull the center hole tightly closed (or pulled to leave an opening of any size you want). I’m as thrilled about this technique now as I was the day I discovered it four years ago. I wanted to grab every crocheter I could find and say, “Do you know about this? You need to know about this!” And so I submitted it to the then online magazine (since turned online community), Crochet Me, and it was published in the December 2004/January 2005 issue. I titled it The Magic Adjustable Ring: A Better Way to Begin Crochet in the Round because to me, it really was magic, changing my whole outlook on crocheting anything that started as a circle. The newsletter Jennifer guest authored this month (July 2008) was Yarn Can Make This! from the web site YouCanMakeThis.com. Although the web site recently turned two years old, this was the first issue of Yarn Can Make This!, a newcomer in addition to their other two newsletters, You Can Make This! and You Can Sew This! 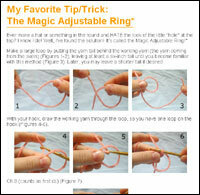 If you’re a subscriber to the newsletter, I hope you enjoyed my adjustable ring tutorial! If you’re not (yet! ), you can see the archived issue online. *One of the places you can see the adjustable ring illustrated is in Crochet Me: Designs to Fuel the Crochet Revolution by Kim Werker (page 130). My design in that book is the Circle Rug, made of 60 circle motifs joined in a unique and sturdy fashion (page 125). Thanks for letting us use it! The newsletter came out wonderful!! oo neat. never heard of this newsletter before. thanks for the link! Fantastic technique! Thanks so much for sharing!! Not sure if you know this or not, but the link is no longer available on crochetme.com. hi Donna- oh my gollygosh I love that. I am a knitter but that technique would totally work as a replacement for the appalling cast ons that we use to start a round thingy that involve long pointy sticks and lots of stabbing and swear words. Hi, I love your tutorial and like to pass it on to other people, but the pictures are not working anymore. Is the tutorial posted somewhere else too?